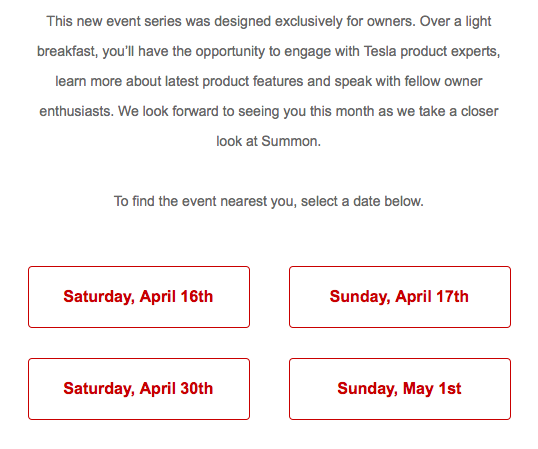 On Thursday, Tesla sent an email to owners to introduce the Tesla Weekend Social program. This program, a way to get local owners together in one place, promised a light breakfast and a chance to engage and learn more about new features. Having already been planning to get together with some local owners the same day and time, the whole group of us decided to attend Tesla’s official event instead. We arrived right on time at 10:00am to quite a few other Teslas pulling in at the same time. 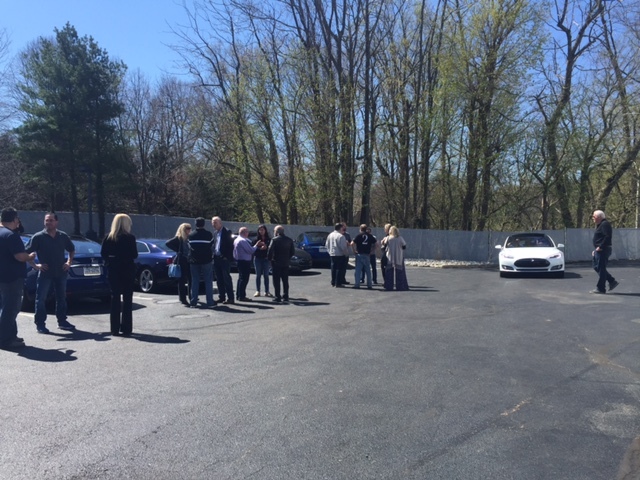 As expected, every charger was already in use and the parking lot space on both sides of the Devon, PA Service Center location had quite a few cars – no doubt including those in for service as well as yet-to-be-delivered new cars. There was a light breakfast, as promised, including bagels, pastries, fruit and coffee from Panera Bread. For at least 30 minutes, guests were free to eat, roam and mingle. Some sat in the waiting room to eat, others stood around chatting. There was a white Model X available for viewing and climbing in. I, for one, got inside and really played around with the seating, steering wheel and mirror positions. As expected, there is a generous range of seating options to grant my petite stature visibility. I also have no issues with the Model S, so this wasn’t a surprise. After a while, the main Tesla employee responsible for the event (Bryan) made an announcement to gather us all around. I was pleased that by this point, I had already learned that the guests ranged from long time owners to those waiting for delivery to a woman who was just returning a 2 day test drive Model S and was seriously in love. We were welcomed and told that Tesla wanted to bring owners together to showcase and demonstrate some new features as well as gain feedback. There were cars set up outside to show us how to use the summon, parallel park and perpendicular park features. Plenty of owners and soon-to-be owners flocked toward those demonstrations once they started, so it appears that even those with AP-enabled cars were unsure of or hadn’t yet used these new features. The conversation inside flowed informally with members of the crowd offering questions and feedback, which was something our host Bryan mentioned wanting. He emphasized many times just how valuable owner feedback is and that Tesla takes both positive and negative feedback very seriously. In fact, he told us that the very first software update on Model S – introducing creep mode – was born from owner feedback. He also confirmed what we already suspect, which is that Tesla does monitor their own forums. By monitor, I really mean monitor, so we were encouraged to keep up the good work giving feedback. As he seemed to expect by a playful comment he made, the conversation turned to charging. Everyone is interested in more Superchargers, specifically at certain hot locations that are currently unserved. Tesla plans to double the number of Superchargers between now and when Model 3 deliveries really get rolling, but as we know their charger plans don’t always pan out. Much of the discussion was around the newer features with one gentleman making a wonderful suggestion to have a learning mode where you can park your car in your garage while in this mode and have it memorize your position. This would probably be perfect for another guest whose feedback was that he can’t use Summon to get his car into his garage due to a center pole that the car just seems bent on getting too close to comfort to. Other feedback was that eventually, the car needs to know how to handle driveways that are not a straight line out of the garage, as well as have a higher tolerance for driveways on an incline with lipped garage openings. Once we were done chatting, we all made our way outside to see some of the demonstrations. As someone who is well versed in the features, I hung back and chatted with other owners. As always, this was the highlight of the event. Some of them I already knew and others were my pleasure to meet. One couple that seemed too shy to join the group and stood alone turned out to be soon-to-be owners in the midst of a wait for a 70D. They already have an outlet in their garage, it just needs the car. 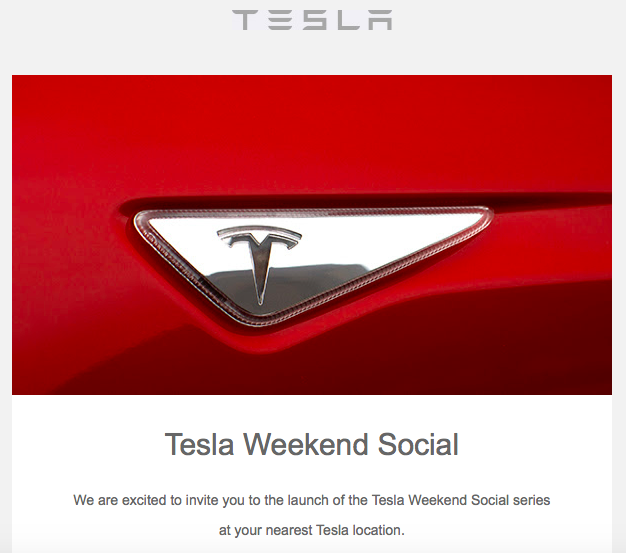 Tesla hit a home run with this idea and I encourage every owner to attend the Tesla Weekend Social to enjoy the company of other owners and make your voice heard to Tesla.